Cook pasta for 11-13 minutes. Before draining the pasta, retain at least a half a cup of the pasta water. Drain pasta well. 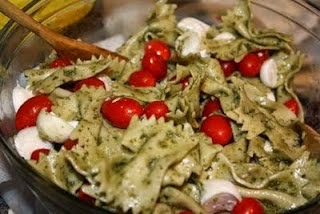 Return pasta to the pot in which it was cooked (removing it from the heat) and add the pesto. Stir to combine. Add the pasta water until it is creamy (between 1/4 to 1/2 cup). This will keep the pasta and pesto from drying out without having to add any more oil. At this point you can let the pasta sit in the fridge until you are ready to serve. Just before serving, add the tomatoes and mozzarella. Toss to coat with pesto. Serve immediately.